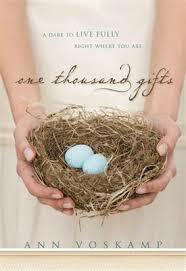 I’ve started this year reading Ann Voskamp’s One Thousand Gifts. The style is poetic, sometimes intrusively so, but the thesis is wonderful, and wonderfully elaborated. We all need this. “And he took bread, gave thanks and brake it, and gave it to them…” (Luke 22:19 NIV). But there is more, and I read it. Eucharisteo, thanksgiving, envelopes the Greek word for grace, charis. But it also holds its derivative, the Greek word chara, meaning “joy.” Joy….. Deep chara joy is found only at the table of the euCHARisteo–the table of thanksgiving. I sit there long…wondering…is it that simple? So then as long as thanks is possible…I think this through. As long as thanks is possible, then joy is always possible. Joy is always possible. Whenever, meaning–now; wherever, meaning–here. The holy grail of joy is not in some exotic location or some emotional mountain peak experience. The joy wonder could be here! Here, in the messy, piercing ache of now, joy might be–unbelievably–possible! The only place we need to see before we die is this place of seeing God, here and now. Think of every illness you’ve ever had: not just the serious sicknesses, but even every cold and flu. Canker sores and rashes, too. Seriously, make a list. You’ll be surprised. There must be dozens. Your body has recovered from them all. Think of every injury you’ve ever had: not just the broken bones, but every paper cut, every jammed knuckle, every bruise, every stubbed toe, every sprain, and any and all boo-boos since you were born. There must be dozens of these, too, if not more. Your body has healed them all. Think of every headache, every sensitive tooth, every stomach ache, every stiff back, and any other soreness you’ve ever had. These could number in the hundreds. Your body has persevered in spite of them all, overcome them all, and continued to serve you and allow you to live each day after they’ve been forgotten.